Keyword optimization is an important aspect of SEO. Knowing which terms to target and how to target them is a fundamental part of any content strategy. This post is going to break down the basics behind finding and utilizing specific search terms in your site content to boost your search engine rankings. Whether you’re creating content for an entire website or just one blog post, you probably have a topic in mind. This is the starting point for creating a list of target keywords. The best posts deal with specific issues within the general site topic, and target only a few keyword phrases at a time. Utilizing both your own knowledge of your general topic as well as some helpful online tools, you can find the best phrases to target with your content. But how do you know which phrases people are searching for? The best place to start is the Google Keyword Planner, a tool which will give you data on the monthly traffic volume (and more) of a specific search term. You can also use the tool to extrapolate on a group of search terms, creating a larger pool of related words and phrases. Starting with a few keywords regarding the specific topic of your article, you can quickly build a large list of words and phrases. Then, you can select the best to utilize for your web page. How do you know which search terms are the best? This metric is easy to understand at face value, but can be misleading. Obviously more search volume means more opportunities for users to visit your site, but a term with higher search traffic is not always better than one with lower search traffic. For a water ski dealer in Miami, the phrase “Buy a water ski in Miami” with 500 monthly searches will likely bring in more direct sales than “water ski” with its 50,000 searches per month. The first group of 500 users have a specific need that the dealer can meet, whereas the 50,000 users searching for “water ski” might just have a general interest in the sport. On the contrary, an extreme sports blog that makes money via page-view advertising will likely be better off with the “water ski” term. They make money for every visitor that sees an ad, so their profit is tied directly to how much traffic their page receives, regardless of what the user does afterwards. Search volume is an important metric to consider, but is not the only aspect to consider when choosing your target terms. The previous example touched on search intent, which should also be carefully considered when developing your keyword strategy. There is likely a specific action you want users to take on your website, which will determine the intent you want visitors to have when arriving on a page. An online shop wants visitors to eventually make a purchase, which will have a direct effect on target phrases. Keywords utilizing product or brand names along with phrases like “best price”, “free shipping”, “online coupon”, etc show that the user is interested in buying the specific product rather than simply looking for information. While competitors are busy trying to move up the ranks for the product or brand name, this online shop could create several pages to target these “buyer intent” terms and bring in better quality traffic with less competition. The competitiveness of a particular keyword is difficult to measure with Google’s metric, and will almost always require manual research. A good rule of thumb is that if no sites comparable to yours appear in the first ten search results for a term, it is likely too competitive to be worth your time. Large sites with thousands of pages and links have built up a lot of authority in Google’s eyes, and will be difficult to surpass with a keyword strategy alone. If you are a small local business with a ten page website, trying to tackle a search term dominated by the New York Times, Huffington Post, and the Atlantic, you’re going to be fighting a long, uphill battle. You’re better off competing for terms where you can match and exceed the competition’s SEO efforts, both in terms of on-page and off-page optimization (Strong backlinks, Social shares, etc). That’s not to say you shouldn’t go for a highly-competitive keyword – they are often the most lucrative. Still, try and stay within your reach and balance your efforts with the value of the search term. Now that you’ve thoroughly researched the best keywords to target with your article, it’s time to start writing. With all things SEO, however, it’s important not to rush in. All of your careful planning will go to waste if you do not take equal care in writing your post or page. 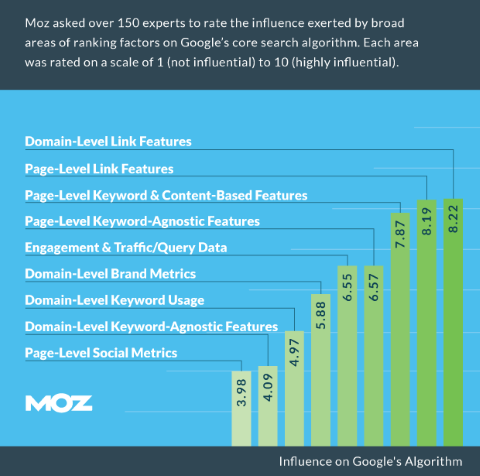 According to Moz’s most recent survey, your keyword strategy is one of the top 3 ranking factors, and the only on-page factor at that. Getting it right is extremely beneficial to a new page’s SEO potential, and utilizing your target keywords in the correct areas while maintaining a high quality of unique content will give you an incredible advantage right out of the gate. Back in the early days of SEO, keyword optimization was as simple as taking a group of target terms and phrases and using them as often as possible in your site content. Search engine spiders were far less complex, and their understanding of the topic of a webpage was heavily based on the frequency that terms appeared in the text. Tens of years and millions of dollars in R&D later, Google and other search engine titans have built incredibly complex methods of analyzing the webpage topics. As a result, there is much more to ranking for a particular keyword than using it repeatedly; placing your target terms strategically will give you a much better result. The title tag is where you want to place your main keyword. This is where search engines will go to find the text for your search result link, and having the exact search text here will help increase your CTR (Click Through Rate) as well, another positive SEO signal. The H1 tag is the top-level HTML page heading, and it will usually be the same as your page title for consistency. As such, your main word or phrase will also appear here, another extremely strategic location for SEO. However, there are still five other heading options, any and all of which can be used to secure your placement for other target search terms. Many webpages do not utilize a proper HTML heading hierarchy, or neglect to drill down to the more-specific headings. Utilizing all six heading types not only gives you an opportunity to include more variations on your keywords, it also shows the search engines that you provide in-depth, organized information. Another beneficial area to place key phrases is in the page URL. Depending on how your site is set up, there are a variety of ways to do this. A Content Management System like WordPress will let you define a permalink structure which can organize URLs for webpages based on hierarchy, categorical associations, post types, etc. With a little forethought, you can define your permalink structure to dynamically include supporting keywords that will help your page rank for more specific terms. Images are an important part of any webpage, and the image alt attribute is another strategic area to place key phrases. Strong and emphasis tags are less powerful areas to place your terms, but could be the difference that puts you a hair ahead of the competition. The meta description is a beneficial area to house some target terms. The important thing to remember is to use your chosen terms and phrases sparingly, and in different locations. If you can use one term and a variation on another in the same location, even better – just make sure everything still reads naturally. This is a theory that holds true in modern language and has now been applied to search engines, much to the dismay of keyword crammers. The idea is that the words that appear most often in a body of text (‘the’, ‘a’, ‘is’, ‘will’, etc) are actually the least important and not indicative of the topic of the article. This is one of the main reasons we want to use our keywords and phrases very sparingly and as diversely as possible. LSA/LSI is the reason you don’t need to cram keywords onto a page to let the search engine spiders know what it’s about. When humans speak, we may refer to something specifically at first, but will then use generic terms, pronouns, or synonyms to refer to it in the future. To constantly refer to something by name would seem jarring, so we use other terms as stand-ins. Google has spent years analyzing the web and looking at the relationships between words, and as a result search engines are very capable at understanding latent semantic relationships. For example, an acronym ‘PS’ can mean a lot of different things, and a search for ‘PS’ is probably going to return a wide array of different results. However, a search for ‘writing a PS’ might bring up several webpages related to letter-writing, whereas a search for ‘PS digital art’ will likely bring up a results about Adobe PhotoShop. Search engines understand the relationships between words to the point that it is no longer necessary to ‘write for robots.’ Techniques like keyword cramming come from a time when SEO content had to account for the limitations of search engine algorithms. That time is long gone, but old SEO habits die hard, and returning to a conversational writing style can be a big hurdle for established SEO content writers. This brings us to the meta keywords tag, the area where you’re intended to place all the keywords regarding the topic of the webpage. You know, so you can help those robots understand what your page is about. If you’ve been paying attention so far, you might realize that this tag is very obsolete at this point. In fact, most search engines only use it to easily figure out which webpages are blatantly attempting to manipulate the system and penalize them accordingly. Don’t use the meta keywords tag. If you’re wondering whether a specific change to your page is going to get you in trouble with Google, it’s best to first consult the Quality Guidelines. Now that your target keywords are in place, you can focus on the remainder of the text content for the page. At this point, optimization should take a backseat to writing readable, relevant content that will appeal to humans, not robots. With your new found knowledge of LSI, make an effort to naturally incorporate terminology and topics related to the main subject of the web page. There are tools available to help determine LSI terms for a given keyword, but in-depth knowledge on the subject will likely be most valuable in finding the right related words. Interacting with communities that focus on a subject and listening to the industry terms that are commonly used is the best way to use LSI to your advantage. Knowing the lingo can really help hone the specificity of your article. As you start incorporating different related terms and using them in variation and combination with one another, you’ll end up with an extremely diverse group of keywords that are simultaneously all relevant to your main topic. These unique combinations and variations make up your long-tail keywords. Long-tail keyword are more specific search phrases, usually 3 or more word long. They tend to have lower search volume, but their specificity will bring in a higher quality of traffic. If you put the proper time and effort into finding your keywords and writing your article, you will likely rank well for your chosen terms. However, you will also likely rank extremely well for many other lower-traffic keywords: the long-tails. Depending on the length of your post, the diversity of your terms, and many other factors, the traffic you receive from long-tail searches might exceed that of your target search terms. Knowing all this, you’re now well-equipped to get serious about your keyword optimization and drastically improve your digital marketing strategy as a whole. Whether you’re writing a five hundred word blog post meant to tackle a smaller keyword or a massive, ten-thousand word guide meant to pull in thousands of visitors a month, these tips will help you develop an iron-clad on-page search engine optimization strategy.